↑ "Zimbabwe - big house of stone". Somali Press. สืบค้นเมื่อ 2008-12-14. ↑ "Zimbabwe Parks and Wildlife Management Authority". สืบค้นเมื่อ 2007-11-13. ↑ 4.0 4.1 "No quick fix for Zimbabwe's economy". BBC. 2008-04-14. สืบค้นเมื่อ 2009-03-01. ↑ "Zimbabwe-South Africa economic relations since 2000". Africa News. 2007-10-31. สืบค้นเมื่อ 2007-12-03. 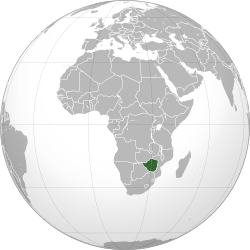 ↑ Organised Violence and Torture in Zimbabwe in 1999, 1999. Zimbabwe Human Rights NGO Forum. ↑ Nick Wadhams (2007-08-01). "Zimbabwe's Wildlife Decimated by Economic Crisis". Nairobi: National Geographic News. สืบค้นเมื่อ 2007-08-05. ↑ 12.0 12.1 "Desperate Mugabe allows white farmers to come back". The Independent. 2006-12-17. สืบค้นเมื่อ 2009-03-08. ↑ Meldrum, Andrew (2005-05-21). "As country heads for disaster, Zimbabwe calls for return of white farmers". The Guardian. สืบค้นเมื่อ 2009-03-08. ↑ Timberg, Craig (2007-01-06). "White Farmers Given Leases In Zimbabwe". Washington Post. สืบค้นเมื่อ 2009-03-08. ↑ "Zimbabwe threatens white farmers". Washington Post. 2007-02-05. ↑ Chinaka, Cris (2007-08-08). "Zimbabwe threatens white farmers on evictions". Reuters. สืบค้นเมื่อ 2009-03-08. ↑ 17.0 17.1 "Zimbabwe inflation hits 11,200,000". CNN.com. 2008-08-19. สืบค้นเมื่อ 2008-08-19. ↑ "Zimbabwe introduces $100 billion banknotes". CNN.com. 2008-07-19. สืบค้นเมื่อ 2009-03-08. ↑ "A worthless currency". The Economist. 2008-07-17. สืบค้นเมื่อ 2008-09-05. ↑ 20.0 20.1 "Hyperinflation in Zimbabwe". Telegraph.co.uk. 2008-11-13. ↑ 21.0 21.1 "Zimbabwe". The World Factbook. Central Intelligence Agency. 2008-05-15. สืบค้นเมื่อ 2008-05-26. ↑ The World Health Organization. "Annex Table 1—Basic indicators for all Member States". The World Health Report 2006 (PDF). สืบค้นเมื่อ 2009-03-10. ↑ "Zimbabwe". UNAIDS. สืบค้นเมื่อ 2007-12-03. ↑ "The People of Zimbabwe". สืบค้นเมื่อ 2007-11-13. ↑ "Ethnicity/Race of Zimbabwe". สืบค้นเมื่อ 2008-01-06. ↑ "Languages of Zimbabwe". สืบค้นเมื่อ 2009-03-18. หน้านี้แก้ไขล่าสุดเมื่อวันที่ 28 มกราคม 2562 เวลา 14:49 น.